What is our intention for this meeting? What’s important? What matters? — Oprah Winfrey. She starts every meeting with these three questions. Figure 1: Number of Friday the 13ths By Year. I have been tutoring math at the local library and using Excel as a vehicle for encouraging people to explore everyday math. While at the library, I heard a young man ask "How many Friday the 13ths are in a year?" Since I am always looking for computational examples, I showed him how to use Excel to find the answer for himself. This post shows how I taught him to solve the problem. 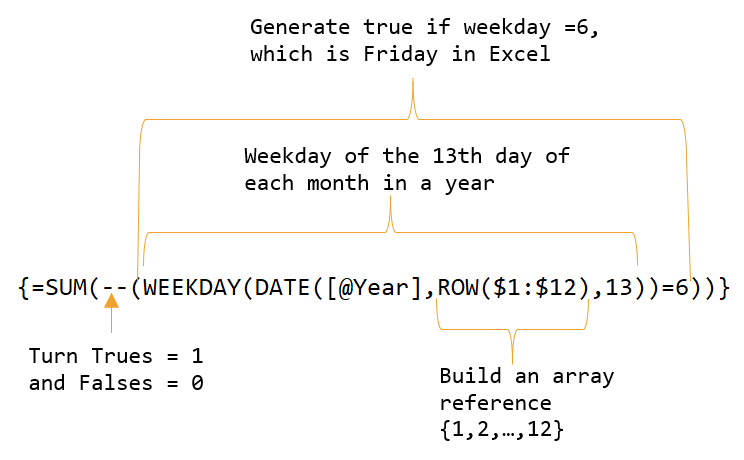 The solution turned out to be a good example of using Excel's date and array capabilities. Figure 1 shows a simple table with the number of Friday the 13ths by year. 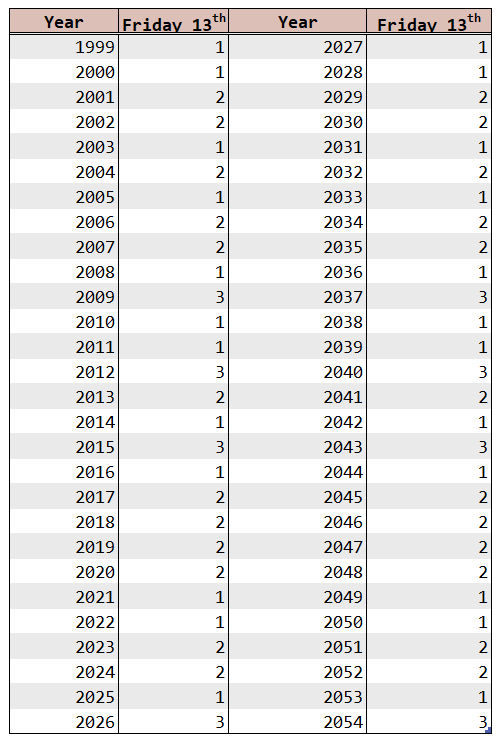 I deliberately made the table 28 years per column to show that calendars repeat with a period of 28 years. I use this characteristic of calendars to buy old calendars that I can reuse; I love old Christmas and tool company calendars. Figure 2 shows the Excel array formula I used to compute the number of Friday the 13ths. My workbook is here. Figure 2: Formula Breakdown for Calculating the Number of Friday the 13ths in a Year. Sorry about forgetting the workbook. I just put it out there. This was a quick post before I started to get ready before Thanksgiving and was a bit rushed!